First came boneless wings. Now KFC wants you to chow down on a sandwich that uses (what else?) chicken for the bun. 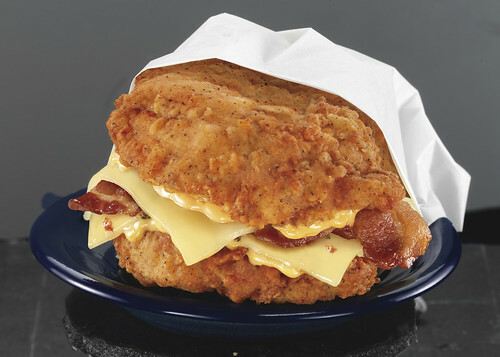 The KFC Double Down, which launches Monday, is essentially a sandwich with two chicken filets taking the place of bread slices. In between are two pieces of bacon, melted slices of Monterey Jack and Pepper Jack cheese and a zesty sauce. How much will it cost? 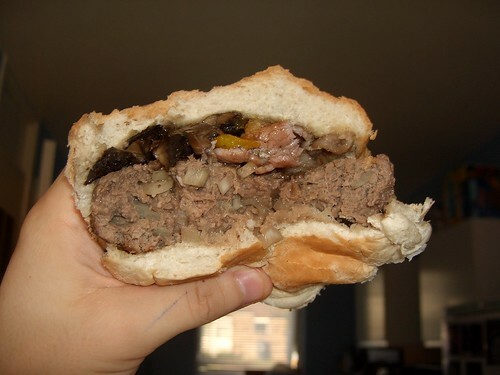 About $5 and 540 calories (460 for the grilled version), putting it on caloric par with fast-food standards like the McDonald’s Big Mac or a large order of french fries at Burger King. But calories aren’t everything. Nutritionists caution that consumers also should pay attention to the sandwich’s salt and fat. The Double Down has 1,380 milligrams of sodium (1,430 milligrams grilled). That’s close to the American Heart Association’s recommendation that adults eat less than 1,500 milligrams of sodium per day. “This is not a healthy choice,” said Walter Willett, chairman of the nutrition department at the Harvard School of Public Health. Elisa Zied, a registered dietitian and spokeswoman for the American Dietetic Association, said the 32 grams of fat is about half the total fat most Americans should be getting in an entire day. She also was concerned about the saturated fat content. KFC’s timing with the Double Down — which will be available through mid-May — may seem odd when many fast-food restaurants are promoting healthier menu items to please an increasingly health conscious public. KFC’s parent company, Yum Brands Inc., has committed to placing calorie counts on menu boards at corporate-owned restaurants nationwide by Jan. 1, 2011. A recently passed federal law eventually will require all chain restaurants to do so. But the company said the chicken-as-bun concept tested so well in selected markets last year they decided to introduce it nationwide for a limited time. KFC spokesman Rick Maynard noted that “more indulgent” sandwiches like the Double Down share menu space with lower-calorie options. “That’s one of the things that make our restaurants popular,” he said. “We have something for everyone.” First came boneless wings. Now KFC wants you to chow down on a sandwich that uses (what else?) chicken for the bun.